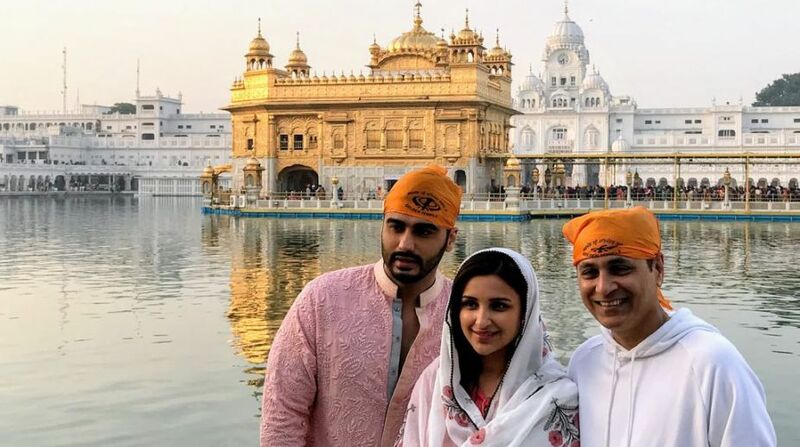 Actors Arjun Kapoor and Parineeti Chopra, who will reunite on-screen in Namastey England after Ishaqzaade, recently visited Golden Temple to seek blessings for their upcoming film. Directed by Vipul Amrutlal Shah, Namastey England is not a sequel to Namastey London and will depict new romantic tale featuring Arjun and Parineeti. The team is currently in Amritsar for shooting some sequences, which will followed up in Ludhiana and Patiala. Arjun and Parineeti are all set to play Punjabi characters in the film and what better way to showcase the ethnicity of Punjab than shooting in the state. According to sources, Namastey England will be filmed at more than 75 places across the globe with locations in Punjab being the key. Also Arjun is looking forward to shoot the Punjab sequence as the actor always wished to stay and discover Punjab to get a deeper sense of the culture, food and Punjabiat. Directed by Vipul Amrutlal Shah, Namastey England will release worldwide in late 2018 or early 2019.